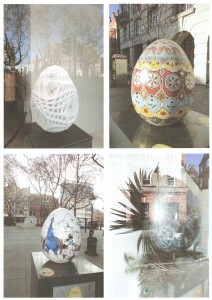 OVO in Hugo Boss’s window; Seraphina, to the left as you leave the station; Birth of Lilith in Peter Jones’s north west corner window; Peacock in his Pride, centre square, with Royal Court Theatre, the red brick building behind him. What do you do on a bright, cold morning when it’s April Fool’s Day and you’ve written 1,000 words before breakfast? Me, I went for a walk and photographed eggs. Not just any eggs, you understand. Sodding great artistic creations for this year’s The Fabergé Big Egg Hunt in aid of Action for Children and Elephant Family. I’ve been looking at these things with curiosity and pleasure for a few weeks but, up to now, I’ve only remembered to take my camera once and the eggs all move tomorrow. You can see them in Covent Garden, from Tuesday. So just for me — and anyone else interested — here are my neighbour eggs on their last day in Chelsea, photographed between 8.00 and 9.00 am 1 April 2012. Union Jack, of which one aspect is not what you expect and very London– nice! ; Jack’s neighbour Sir Hans Sloane, who said chocolate was really good for you, making him utterly statueworthy; Love and Flourish, Versailles blue and silver mosaic, the prettiest egg I’ve seen; Pandora, though I’d have called it Eye of Sauron, myself. Goodbye, guys (except Sir Hans). Great to have known you! Beautiful eggs! What a lovely morning for it, too. They remind me of the colourful elephants a couple years ago. Remember those? Lovely, Jenny. Thanks for those. Sometimes I miss London. How lovely, Jenny. 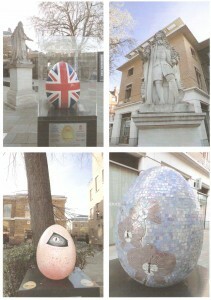 I meant to do an egg hunt in London and completely forgot when I was there. I do love these clever ways people are coming up with to make us focus on around-us again. We had life-size painted horses in Newmarket last year – was such fun spotting them. A couple were surprisingly had to find for such big, colourful creatures! I loved the painted elephants, Talli. They had faces. Eggs aren’t so charming, at least to me, but seem more mysterious somehow. Lots of them seem to come with stories attached too; they just need a bit of teasing out . . .
Every time I think London is too crowded, noisy and tacky, something like this comes along, Lesley. I went looking for those Newmarket horses, Jan. Having found them, http://tinyurl.com/crcs2yo , I can see that it must have been a real challenge to hide them. How joyful! Just love stuff like this. 🙂 Thanks for sharing, Jenny.